As the old saying goes when you're on a good thing stick to it, Jon Favreau re-teams with Vince Vaughn for their second feature together, Made. Swingers their first film enjoyed critical success and in the years since the film gaining cult status with its quotable lines of dialogue. While I enjoyed Swingers I found it a little stilted and uneven, as it was obvious that these two young actors were still finding their feet in Hollywood. In my opinion Made is an evolution of the hapless buddy friendship portrayed by the two in Swingers, both Vaughn & Favreau clearly better at their trade since Swingers. While they are both playing different characters in this film the buddy aspect of Swingers carries over with Favreau as the shy down on his luck awkward guy while Vaughn as the in your face cocksure bonehead! Ricky (Vaughn) and Bobby (Favreau) are best mates and as it also appears lousy boxers. Having known each other since school days much to their peril the pair are inseparable. Bobby has some familial connections to the "organised" family of sorts and while reluctant to get involved with the mob one thing leads to another and Bobby finds himself in hot water and indebted to his uncle Max. Max played by the eternally craggy Peter Falk, has a job for Bobby that will smooth out all of Bobby's debts to Max. Booby is to take Ricky with him to New York and deliver a "package". In Ricky's eyes this is the big break that they (nay mostly Ricky!) have been waiting for, Bobby on the hand isn't so sure. The pair then hit the road to carry out Max's errand and from the outset Bobby is clearly out of his element while Ricky using his knowledge of mafia folklore garnered from studying films over the years guarantees that they should complete the job with ease. Wrong! As you would be expect nothing goes right, the blame lying squarely at the feet of Vaughn's character that gets the pair into all manner of trouble with the worst kind of people. It's clear to everyone else that these two are a bunch of no-frills gangsters. Vaughn's character Ricky draws most of the laughs in the film, as he is such an obnoxious idiot that cannot see the error of his ways that you wonder how Bobby has put up with him for so long. 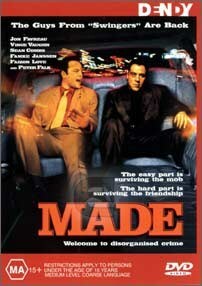 Vaughn's performance in Made in this reviewer's opinion is Gold, and by the end of the film I wanted to strangle him! The desired response I think, as it was hard to find any redeeming features in Vaughn's character. Written & directed by Jon Favreau Made is a good way to spend a couple of hours in the dark. There are plenty of laughs and the film crackles along delivering some great lines and funny set pieces that I'm pretty sure every guy can identify with and in some ways relate to. After all haven't we all had one mate that just couldn't keep is trap shut at the time? This film takes it to the next level...And then some! Presented in aspect ratio of 1.78:1 (16:9 enhanced) made scrubs up very well on DVD. The picture as you would expect for a semi-recent film is generally clear of film to video artefacts but does struggle with some of lower lit scenes where film grain creeps in and is very noticeable. Having not seen this film theatrically I can't tell whether this is intended result or a problem with the transfer. On the audio front we have two tracks to choose from, a Dolby Digital 5.1 as well as a surround encoded Dolby Digital 2.0 stereo track. Both serve the film well, the discrete 5.1 track being the preferred experience. A modest array of extras accompanies the feature and is worth a look, they are hardly anything that will warrant a repeat viewing but their inclusion is appreciated. Sadly the action telestrator commentary which is a riot and available on the Region 1 release hasn't been ported over to the local version here.